This series is visualized on the screen as a smooth line connecting all data points. As all scatter series, this one also requires the RadCartesianChart to define two LinearAxis as vertical and horizontal axis. DashArray: A property of type DoubleCollection that gets or sets the dash pattern applied to the scatter spline series itself. Stroke: A property of type Brush that gets or sets the stroke of the scatter spline series. StrokeShapeStyle: A property of type Style that gets or sets the style of the stroke of the scatter spline series. The property accepts a style that targets an object of type Path. You can use the YValueBinding and XValueBinding properties of the ScatterSplineSeries to bind the DataPoints’ properties to the properties from your view models. 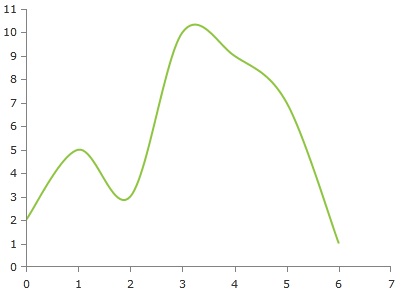 You can see how to style the scatter spline series using different properties in the ScatterSplineSeries section of the Customizing CartesianChart Series help article. Additionally, you can use the Palette property of the chart to change the colors of the ScatterSplineSeries on a global scale. You can find more information about this feature in the Palettes section in our help documentation.